Increase the drilling depth of your auger with a Digga auger extension. For drive units with 2.5in hex shafts, the XO25 outer extension is available in 4 different lengths - 4ft, 6ft, 8ft, and 10ft, while the XT25 telescopic extension (inner) comes in 4ft, 6ft, and 8ft lengths. Easy fit design with no adaptors required helping you connect and disconnect your augers faster. Welded hub and shaft reduces excess play in the connections ensuring a straighter hole. A telescopic design makes it easier to drill deeper as well as easier to transport. Inner extensions can be slid inside outer extensions and augers saving space and reducing loading time. 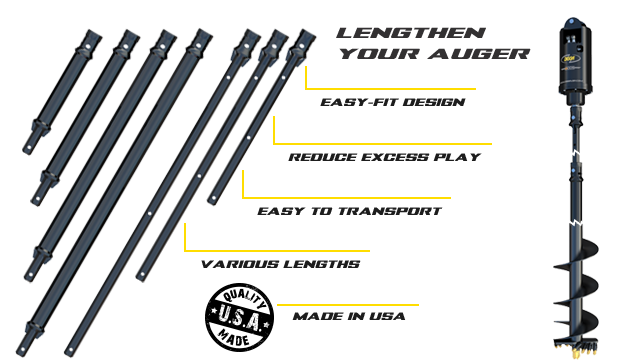 Various length options available including 4ft, 6ft, 8ft, and 10ft for XO25 outer extensions and 4ft, 6ft, and 8ft lengths.for XT25 telescopic inner extensions. Our quality products are manufactured in-house by Digga in America. We use only the highest grade materials and strictest quality control.